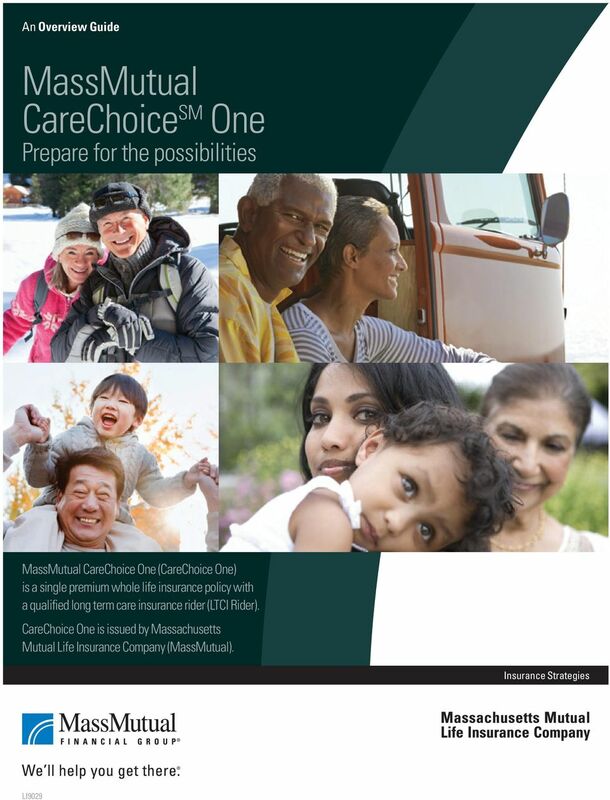 Download "MassMutual CareChoice SM One"
4 CareChoice SM One An additional way to prepare CareChoice One is another way you can prepare for your future long term care needs. Regardless of how your future unfolds, CareChoice One gives you the flexibility to address life s possibilities pertaining to your long term care planning. 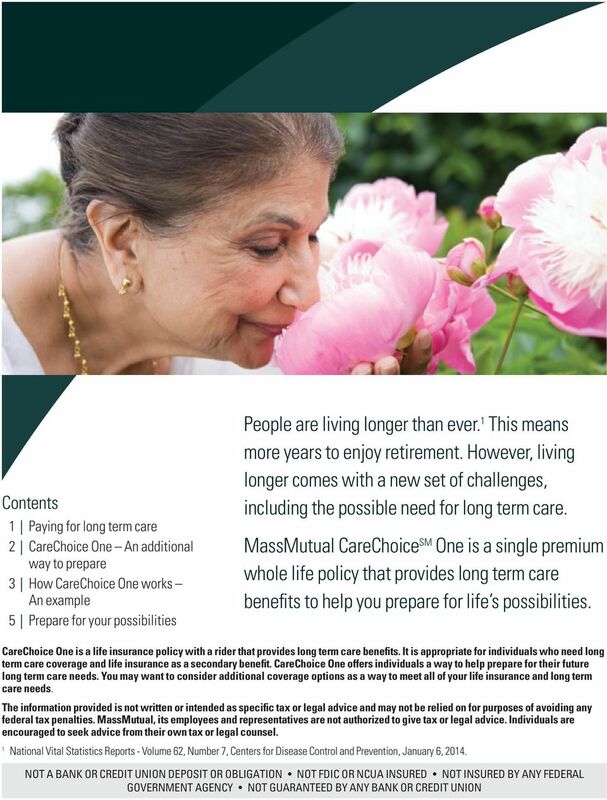 If you need long term care CareChoice One provides a guaranteed pool of long term care benefits (LTC Benefit Pool) that becomes available to pay monthly long term care benefits once the eligibility requirements and a 90-day Elimination Period are satisfied. These benefits are generally received income tax free. 4 If you never need long term care CareChoice One is a whole life insurance policy that will pay a death benefit to your beneficiaries to help secure their financial future. The death benefit is guaranteed and is paid income tax free. 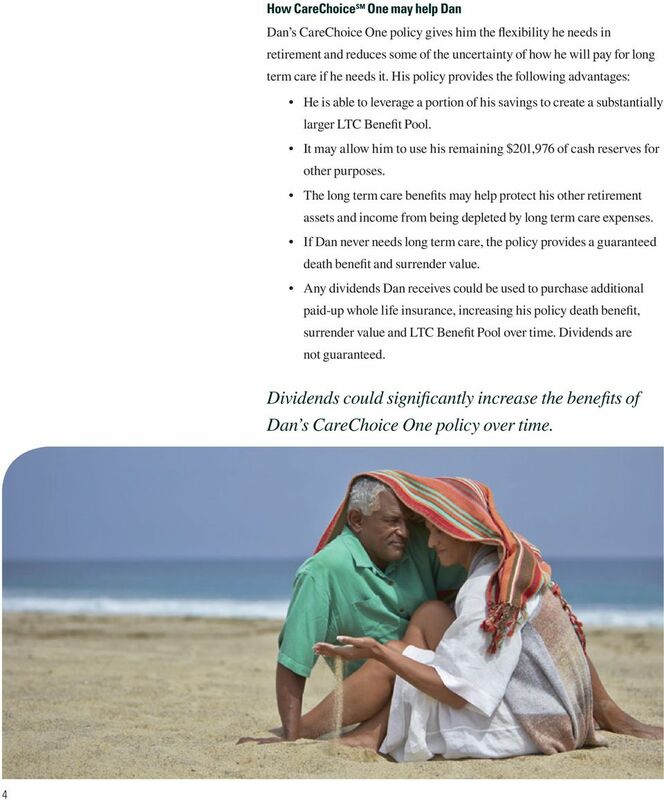 Policy dividends A CareChoice One advantage The whole life policy is participating and therefore eligible to receive dividends. 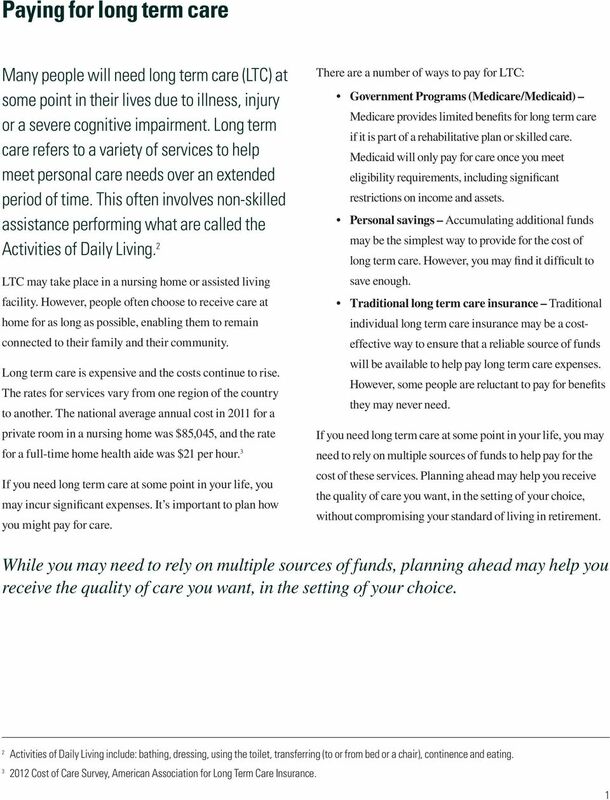 6 You have the option to use your policy dividends to purchase additional paid-up whole life insurance, also called paid-up additions, which will increase your death benefit, surrender value and LTC Benefit Pool. Underwriting is necessary for both the life insurance policy and the LTCI Rider. A medical exam is generally not required, but may be necessary in certain situations. 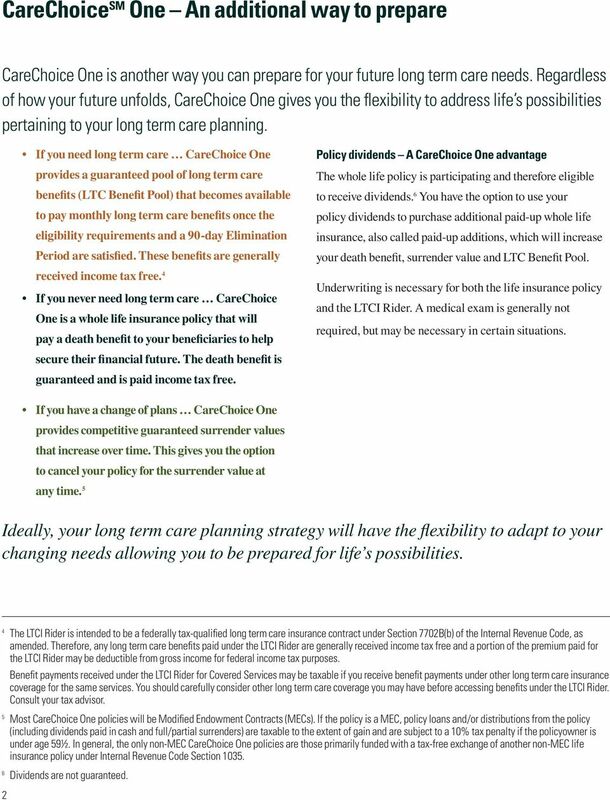 If you have a change of plans CareChoice One provides competitive guaranteed surrender values that increase over time. This gives you the option to cancel your policy for the surrender value at any time. 5 Ideally, your long term care planning strategy will have the flexibility to adapt to your changing needs allowing you to be prepared for life s possibilities. 4 The LTCI Rider is intended to be a federally tax-qualified long term care insurance contract under Section 7702B(b) of the Internal Revenue Code, as amended. Therefore, any long term care benefits paid under the LTCI Rider are generally received income tax free and a portion of the premium paid for the LTCI Rider may be deductible from gross income for federal income tax purposes. 2 Benefit payments received under the LTCI Rider for Covered Services may be taxable if you receive benefit payments under other long term care insurance coverage for the same services. You should carefully consider other long term care coverage you may have before accessing benefits under the LTCI Rider. Consult your tax advisor. 5 Most CareChoice One policies will be Modified Endowment Contracts (MECs). If the policy is a MEC, policy loans and/or distributions from the policy (including dividends paid in cash and full/partial surrenders) are taxable to the extent of gain and are subject to a 10% tax penalty if the policyowner is under age 591/2. 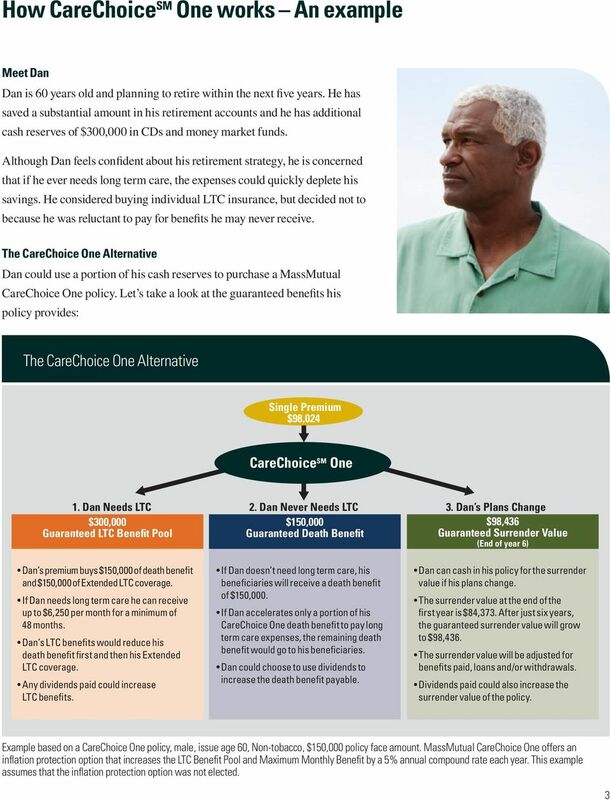 In general, the only non-mec CareChoice One policies are those primarily funded with a tax-free exchange of another non-mec life insurance policy under Internal Revenue Code Section Dividends are not guaranteed. An Educational Guide for Individuals The dividend difference Adding value to your whole life insurance policy Insurance Strategies Table of Contents 2 The dividend difference 4 What are policy dividends? 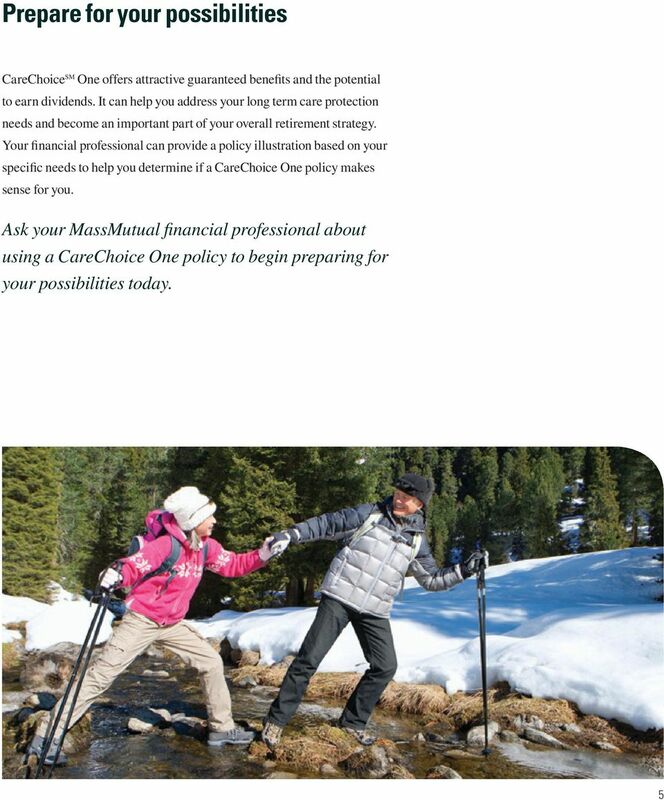 MassMutual Financial Strategies. Whole Life Legacy 100 SM. Making It Easy to Take Care of Business. insure invest retire. 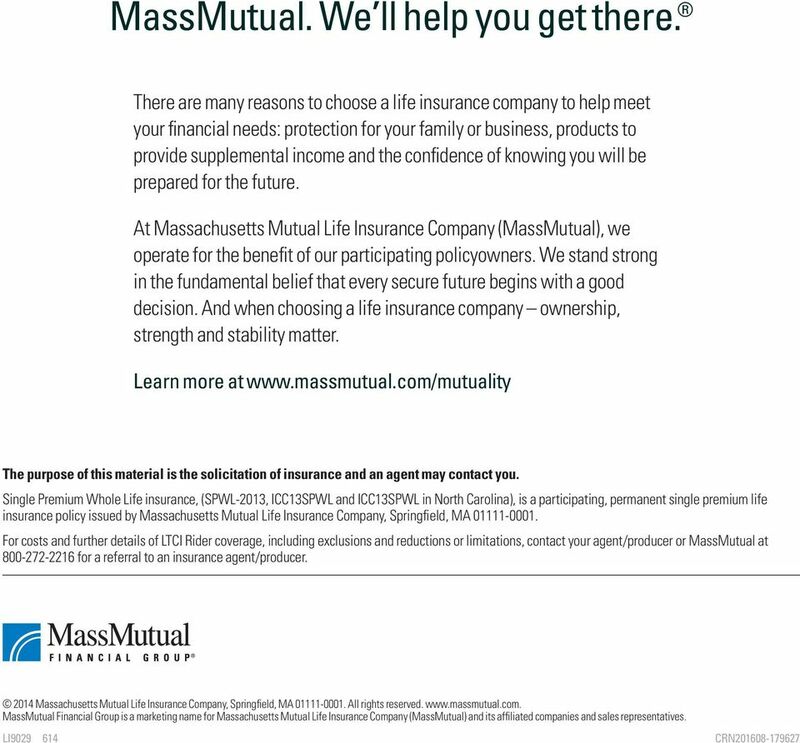 MassMutual Financial Strategies. Avoiding the Double Tax Dilemma. with Whole Life Legacy 100 SM. insure invest retire.